Wilkins, Charles. (2008). 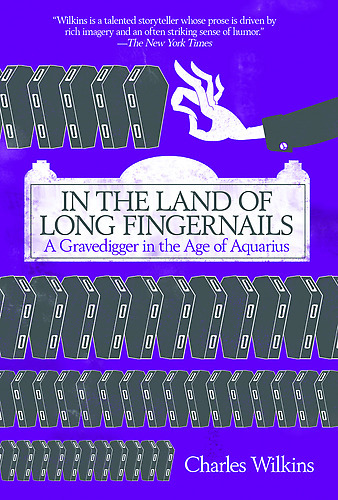 In the Land of Long Fingernails. Greystone Books: Toronto. I loved this book for its familiarity to my sense of place – the setting of Toronto, Ontario, is very close to my hometown of Kitchener, Ontario. It’s not often that I have the chance to read a novel by a local author. This was also a very unique book because it details the author’s period of employment with the fictitiously-named (but real) graveyard, Willowlawn, in the summer of 1969. I’ve often wondered what it would be like to work as a graveyard maintenance person. I previously imagined it as a glamorous and much more mysterious place of work than my own summer place of employment with a conservation area, where I also worked in maintenance tasks. I thought of a graveyard as a workplace where one could relax and be meditative. Photo rights to SONY ReaderStore 2014. Charles Wilkins pops this bubble of fantasy in his expose novel by detailing the hard and often stressful maintenance work required for this graveyard. The characters in the book are diverse and fun to meet – there’s a rambunctious, perpetually drunk Scotsman who oversees the graveyard; a pot-smoking PhD graduate looking for work anywhere else in the world; an ambitious wannabe who foresees the future of the graveyard under his control; and many other zany individuals. There isn’t a plot to the story, but the characters really drive it forward. If you’re interested in getting an inside peek into the life of a student in the 1960s – in the unique setting of a graveyard – and reflecting on the nature of friendship, mortality, and materialism; this book will both charm and please you!